An international team has discovered a 31-km wide meteorite impact crater buried beneath the ice-sheet in the northern Greenland. This is the first time that a crater of any size has been found under one of Earth's continental ice sheets. Map of the bedrock topography beneath the ice sheet and the ice-free land surrounding the Hiawatha impact crater. The structure is 31 km wide, with a prominent rim surrounding the structure. In the central part of the impact structure, an area with elevated terrain is seen, which is typical for larger impact craters. Calculations shows that in order to generate an impact crater of this size, the earth was struck by a meteorite more than 1 km wide. 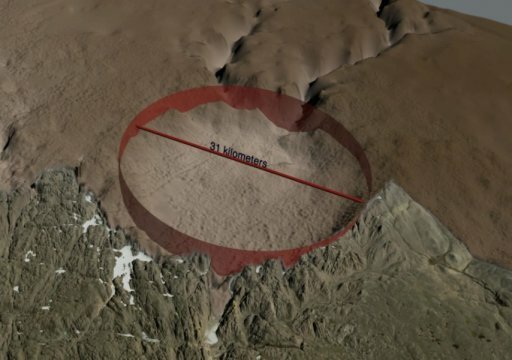 The crater was first discovered in July 2015 as the researchers inspected a new map of the topography beneath Greenland's ice-sheet. They noticed an enormous, but previously undetected circular depression under Hiawatha Glacier, sitting at the very edge of the ice sheet in northern Greenland. "We immediately knew this was something special but at the same time it became clear that it would be difficult to confirm the origin of the depression," says Professor Kjaer. In the courtyard at the Geological Museum in Copenhagen just outside the windows of the Center for GeoGenetics sits a 20-tonne iron meteorite found in North Greenland not far from the Hiawatha Glacier. "It was therefore not such a leap to infer that the depression could be a previously undescribed meterorite crater, but initially we lacked the evidence," reflects Associate Professor Nicolaj K. Larsen from Aarhus University. Their suspicion that the giant depression was a meteorite crater was reinforced when the team sent a German research plane from the Alfred Wegener Institute to fly over the Hiawatha Glacier and map the crater and the overlying ice with a new powerful ice radar. Joseph MacGregor, a glaciologist at NASA, who participated in the study and is an expert in ice radar measurements adds: "Previous radar measurements of Hiawatha Glacier were part of a long-term NASA effort to map Greenland's changing ice cover. What we really needed to test our hypothesis was a dense and focused radar survey there. Our colleagues at the Alfred Wegener Institute and University of Kansas did exactly that with a next-generation radar system that exceeded all expectations and imaged the depression in stunning detail. A distinctly circular rim, central uplift, disturbed and undisturbed ice layering, and basal debris. It's all there." In the summers of 2016 and 2017, the research team returned to the site to map tectonic structures in the rock near the foot of the glacier and collect samples of sediments washed out from the depression through a meltwater channel. "Some of the quartz sand washed from the crater had planar deformation features indicative of a violent impact, and this is conclusive evidence that the depression beneath the Hiawatha Glacier is a meteorite crater, " says Professor Larsen.